In this article, we will explore how we can configure SharePoint Server Hybrid and extend the workloads to SharePoint Online. SharePoint On-Premises and SharePoint Online environment present their own advantages and features to the users. SharePoint Online environment offers the services to handle the business needs. On the other hand, SharePoint on-premises environment offers flexibility and more configuration options. For the organizations who are gradually moving towards the cloud, SharePoint Server Hybrid provides a staged migration path. It helps to extend the workloads to SharePoint Online. SharePoint Server Hybrid helps to bring together the best of both SharePoint On-premises and SharePoint Online (Cloud) features. SharePoint Server Hybrid environment enables trusted communication between SharePoint on-premises and SharePoint online. It integrates functionality and access between features and services of both the environments. Open SharePoint 2019 Central Administration site. An executable file “HybridSPSetup.exe” will be downloaded to the file system. 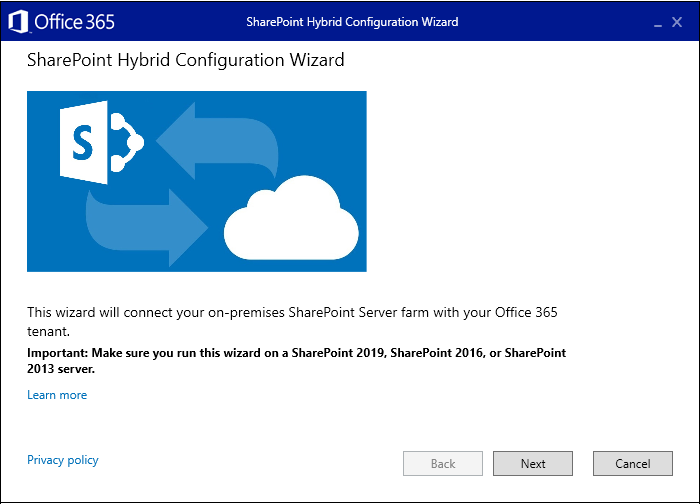 The wizard will open to connect your On-premises SharePoint Server farm with your Office 365 tenant. Click "Next". 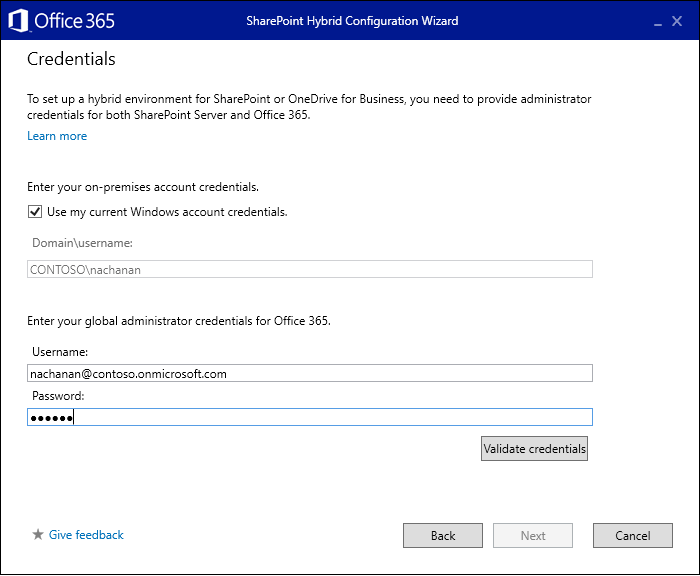 In order to set up a hybrid environment for SharePoint or OneDrive for Business (OD4B), we need to provide administrator credentials for both, SharePoint Server and Office 365. Click "Next". Prerequisites check report will be generated. 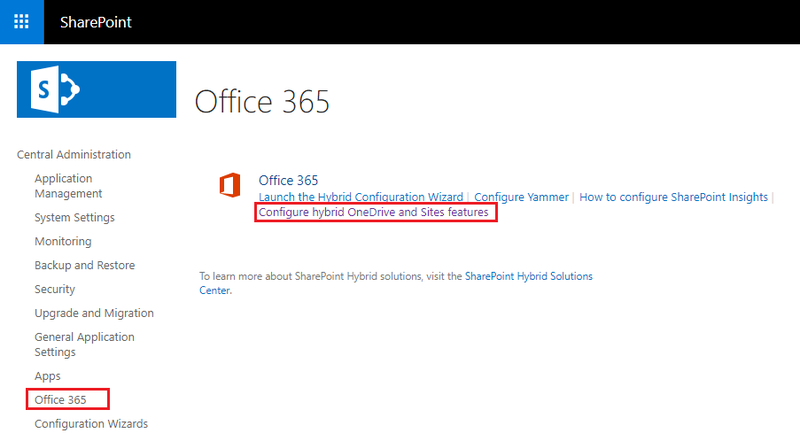 SharePoint O365 Link Settings need to be set for Hybrid Configuration. If you have not set this already, the pre-requisites report will report it. Set-SPO365LinkSettings cmdlet will help to configure Hybrid features (Hybrid site redirection, OneDrive redirection, ODB default to Cloud). Open SharePoint 2019 Management Shell with administrator privileges. Re-run the prerequisites check report to see that all prerequisites are met. Click "Next". Select the features to use in the Hybrid environment. Click "Next". The SharePoint Hybrid Configuration Wizard will run. 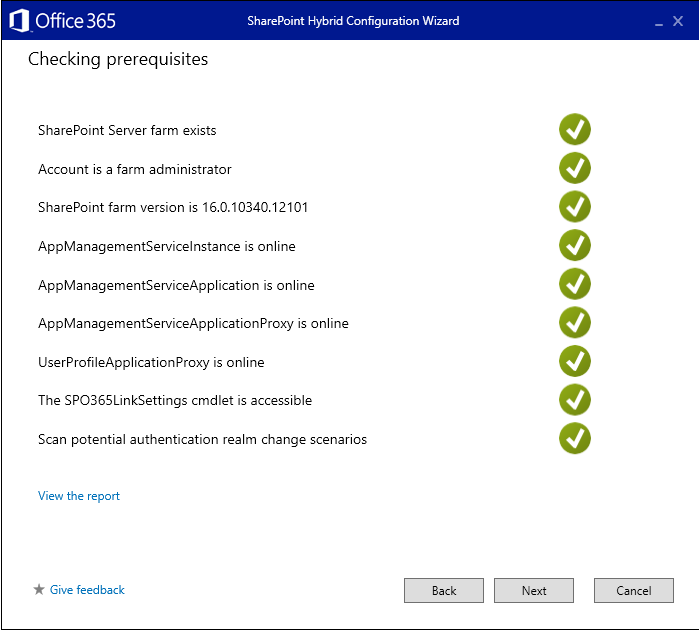 After the successful run of the configuration wizard, the SharePoint Server environment will be connected to Office 365. The summary report will be generated. Click "Close". 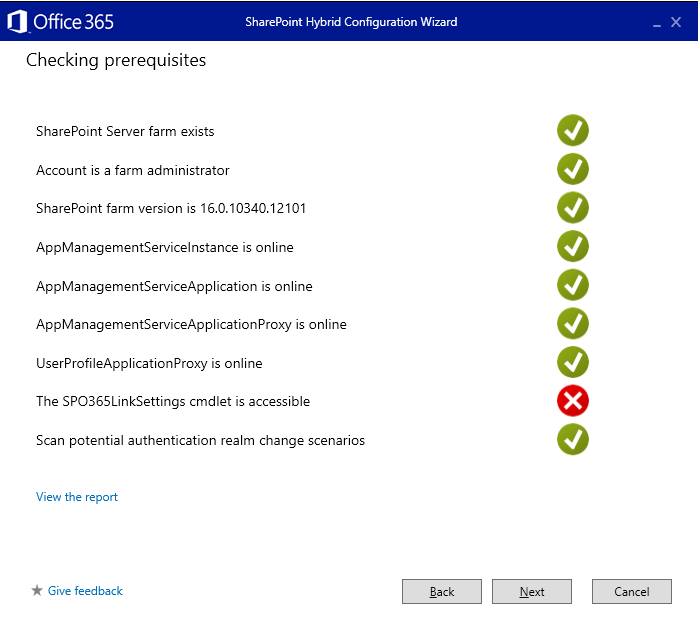 Perform IISReset on SharePoint Server 2019. By default, the below features are configured to use in the SharePoint Server Hybrid environment. 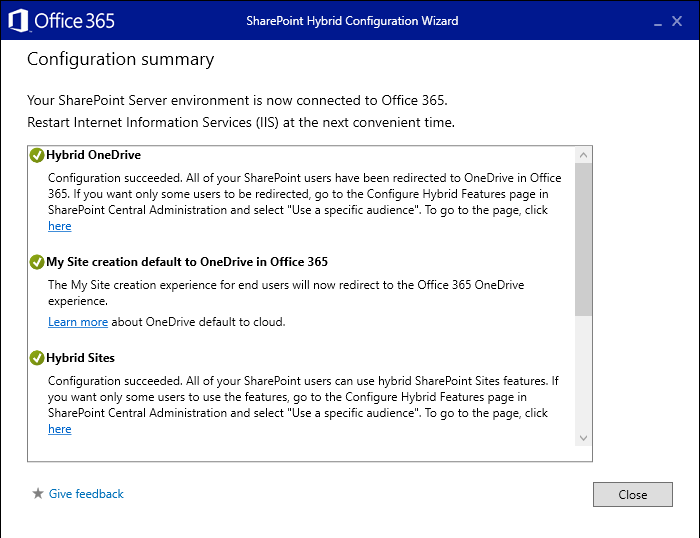 All SharePoint users will be redirected to OneDrive in Office 365. If you want only specific users to be redirected, follow the below process. Open SharePoint 2019 Central Administration. From the left menu, click Office 365. 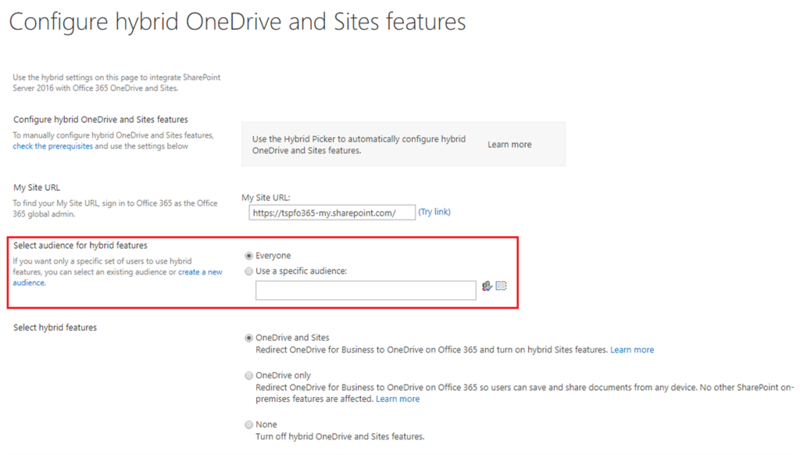 Under Office 365, click "Configure hybrid OneDrive and Sites features". Specify the specific audiences to use hybrid features. Click "OK". My Site creation experience for end users will be redirected to Office 365 OneDrive experience. OneDrive will be defaulted to cloud. You can now navigate across intranet sites in on-premises and extranet sites in SharePoint Online by using the "Follow gesture" in site pages. New hybrid B2B extranet sites can be created from SharePoint Online Admin center, click “New” on the site collections page. This site later can be shared with external users. 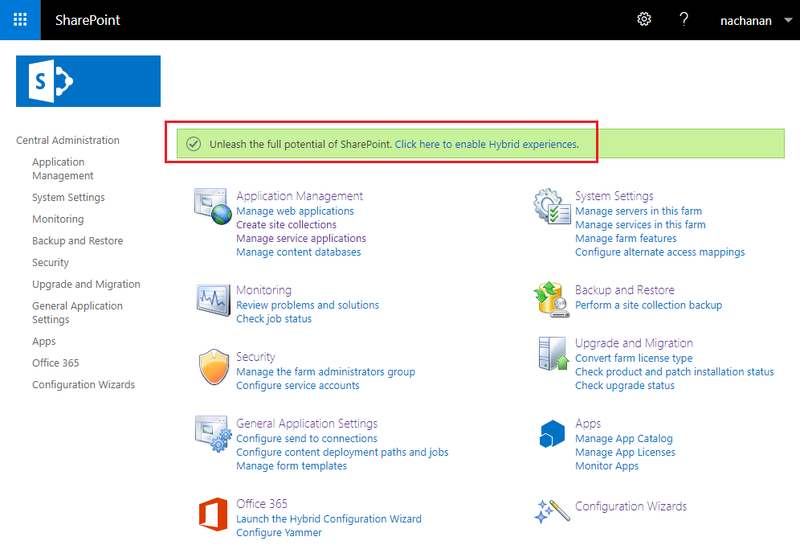 All SharePoint Server users will not have the hybrid app launcher. 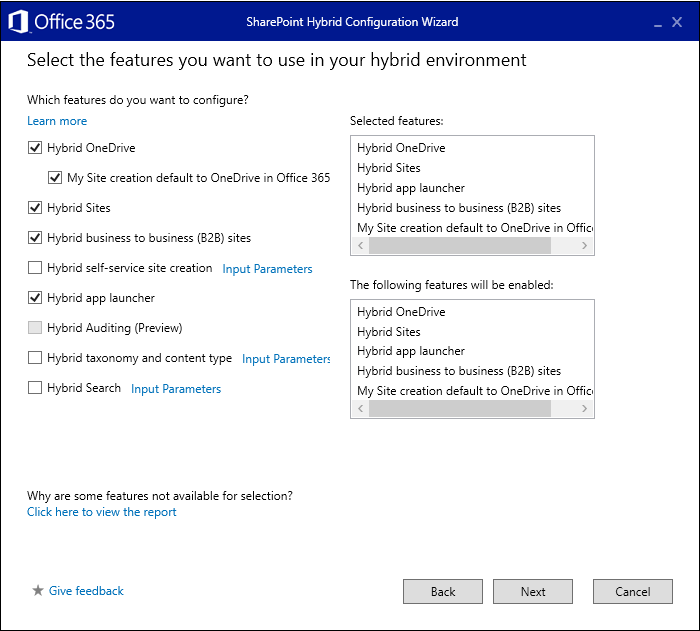 It can be restricted to specific target audiences from SharePoint 2019 Central Administration > Office 365 > Configure hybrid OneDrive and Sites features. SharePoint Server Hybrid helps to bring together best of both SharePoint on-premises and SharePoint Online (Cloud) features. SharePoint Server hybrid environment enables trusted communication between SharePoint on-premises and SharePoint online. Using SharePoint Server Hybrid, we can get the benefit of both the environments.